As any homeowner knows, there are a lot of things in a home that need to be fixed, repaired or maintained. Some home repairs require consulting a professional, and paying to have them fix it. But there are other repairs that a homeowner can often accomplish on their own with a little bit of time, effort and a visit to their local home improvement store. If your door is squeaking and annoying you and your family, you don’t have to live with it any longer. It can actually be a really simple fix to prevent a door from squeaking. You can put a little petroleum jelly on the hinges of a door to stop a squeak. If the problem with your door is that it sticks, you can often use a rotary tool with a different attachment to shave off the edge of the door that is sticking. In order to see where it’s sticking, rub colored chalk on the inside of the door casing, and shut it. Once you open it again and see chalk on the part of the door that made contact with the frame, you’ll know where to trim. Don’t blame water pressure if your toilet’s flush seems off. Many times, the problem is not with the water pressure, but with the holes underneath the rim that can get clogged with calcium and other sediment. If you clean out those holes with a stiff toilet brush, the toilet flush should improve. If your toilet is leaking, you can have a problem if your septic tank ends up filling up too quickly. To fix a leaky toilet, the first step is to check the ball float. The ball float controls the water level in the tank. If the water level is too high, the water will start to flow into the overflow pipe and out the drain. In order to adjust this, you want to tighten the screw on top of the arm mechanism. You can also try bending the arm downward, which will stop the water flow sooner after the toilet is flushed. Leaks in a toilet can often be caused by the flapper. Flappers cost around $5.00 to replace at any home improvement store. All you need to do is pop off the flapper, clean around it to remove any sediment that could keep it from sealing properly, and attach the new flapper. 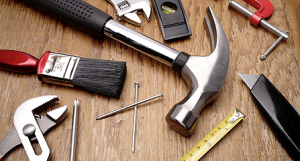 Do-it-yourself home repair can be very simple!